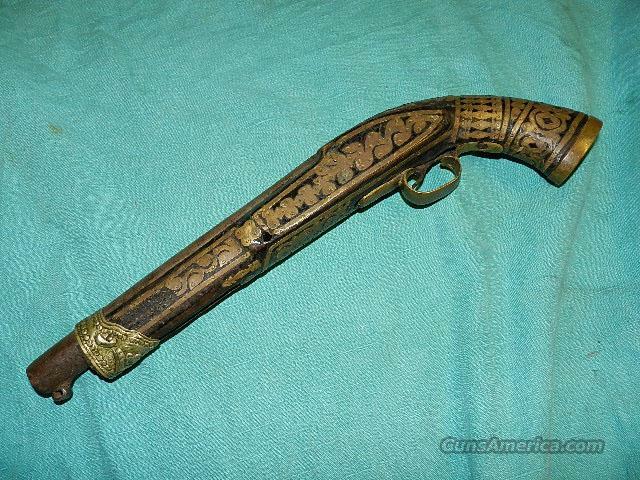 Description: An interesting pirate wooden stock filled with brass designs, and has a flintlock barrel also. Total length is about 16", and the barrel length is about 9+". Cal. is about .60 cal.Needs a lock and the opening is about 5 15/16" long X 1 1/16" wide. Good project gun for the winter.Barrel has two proof marks that are unknown. Sliver of wood missing from front of lock forward along the barrel.I hope you like my wide selection of unusual guns. If you BUY IT NOW you must still contact us for details buy it now doesn't end the sale, it just sends an email telling us you want to buy this gun. Some guns are required shipment to a gun dealer near you for a transfer to you when it arrives. With the widest selection of older guns at great prices, We don’t have a store, and sell on the internet only. We don’t have a web site. OUR DESCRIPTIONS ARE ACCURATE.THREE DAY INSPECTION ON ALL PURCHASES.